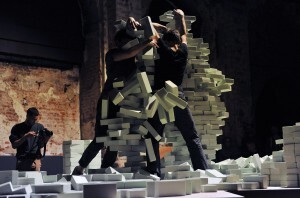 Multidisciplinary Finnish artist Sonja Jokiniemi performed her piece Hmm (2015) during ImPulsTanz – Vienna International Dance Festival; a title who expresses pleasure, astonishment or hesitation and which concentrates Sonja Jokiniemi’s previous works about the language, its perception, its norms and deviations. She has been exploring these topics on stage with OH NO (2013) and Without an alphabet (2014), a project made with autistic young adults, and through several publications such as the drawing book related to her last creation RRRRR (2016). 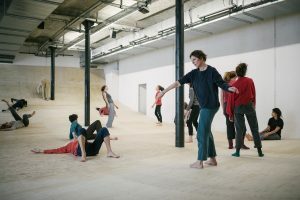 Her solo Hmm shown at the Schauspielhaus on July 26th and 28th had a decor of wooden sticks, thick cellophane, a cardboard box and a triangle lying scattered all over the floor. Sonja Jokiniemi is standing in a beige leather suit when the public arrives. Flickering sounds are filling the space. Few elements produce a multitude of effects. With these objects, Sonja Jokiniemi composes a cosmos on the scale of the theater. She associates them through tactile and vocal manipulations, talking to them, talking for them, in a linguistic performance, in which the language is a capacity to generate meanings and actions. A language that is sometimes hermetic, as the communication she establishes with the public. The spectator has to make the effort, if not to understand, then at least to be attentive to what slips from the ordered and defined language. 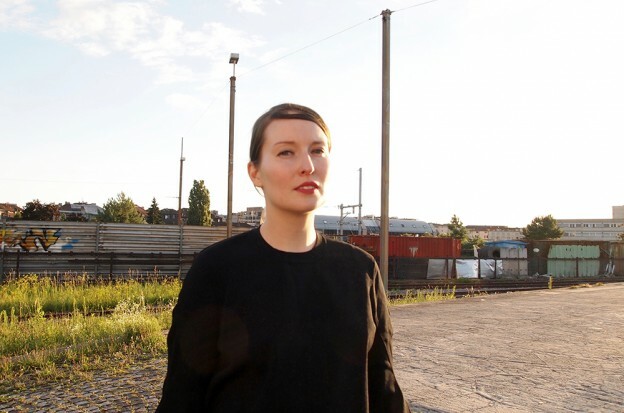 Sonja Jokiniemi explores the borders of sonority, of meaning, of communication by numerous interjections, onomatopoeias, exclamations; sounds and gestures which have numerous significations but don’t call for any answer or reaction. The audience interprets these significations and the structures of language with pain, with joy, impatience and satisfaction. An experience brilliantly led by Sonja Jokiniemi which she accepted to discuss. Let’s talk about the genesis of you performance Hmm (2015). Where did the inspiration come from? What were your projects before that? The work I did before Hmm which is called OH NO (2013) was the final project for my Master in multidisciplinary performance at the Theater Program of DasArts (currently called Das Theatre) in Amsterdam. OH NO was a voyage of two pens and a human giant together with some other materials and miniature objects. The work was based on disastrous events that occurred to the objects and also to the human figure. I was negotiating ideas around non-understanding, non-sense or not knowing how to communicate. I was very interested in John Steinbeck’s Of mice and men the giant figure in the story that cannot find the right way to touch things. When he wanted to be gentle, he petted the mouse so long that in the end it died. For me it was an example of the failure of communication with the surrounding world. We all probably experience at times that our intentions are not perceived/understood properly because of a failure in transmitting meaning. For OH NO, I had worked a lot with miniatures: objects that were very small so the universe quite hermetic in terms of scale. I was very interested in child’s play, but not in imitating a child playing in an adult’s body but how, as an adult, as an artist, one can evoke states of playing and playfulness. I also think that there is a strong psychological power in operating things in a miniature form and trying to understand your own relation and emotive connection on this scale, which then can be communicated with the “big world” out there. Then, Hmm was for me in this trajectory a step ahead. In terms of scale for instance, I changed the pens for sticks which are human size and the stage became a theater stage instead of a miniature world. Indeed, I had worked with the pens during two years so I had an intimate relation to them. It was also a way of saying goodbye somehow. I wanted to create similar intimate relations to these wooden objects, to these plastics, to these materials that appear in Hmm which have been caught with intimacy: with haptics and sensuous practices. Around the same time, I also started the project called Without an alphabet (2014) which was more of a community related research that I did with four autistic young adults in Kuopio in Finland, where I’m from. For some time I have been quite interested in looking into subjective languages because we always have this quest with language that we can communicate to somebody else and that he or she understands what we mean. 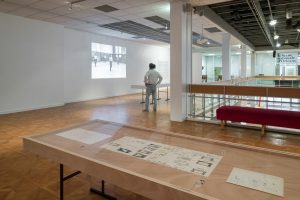 But I was also interested in how to define language through an escape of the definition of collective language in the sense that we all have our personal relation to things around us: to how we perceive, to how we make sense of things, even if this sense is not through signifiers and definitions. I wanted to work with those young adults as specialists into their own language. Here indeed I talk about language in a large sense. For instance children´s first language is movement which is there to trigger a reaction from the caretaker. Some of the people whom I worked with wouldn’t use so many words to communicate but the multiple sense and meaning making processes appeared in diverse ways. For this process, I worked with them during one year going through different phases. In the end I made a duet with one participant Veera Kivelä, with whom I built a very collaborative relationship. The piece was very much based on her materials and her relationship with the surrounding world. I also made a small notation book with selected languages and practices that I encountered with them and also in an activity center for people with disabilities where I worked in Helsinki. Hmm is parallel to this project. It’s not trying to capture an autistic language. Instead I am going through some personal, formalist and playful sense- and meaning making processes with selected objects and materials around. It’s kind of a play and constant negotiation where the objects have their own way of physically relating: sometimes not standing when I want them to for example. So in a way it is also a negotiation of wants and desires. In that piece, I’m kind of a “playgodess”, I take charge of things. But of course, like with everything and everyone, they speak back to you in a way or another. So for me, it’s much about creating language with them and simultaneously forming a kind of paradoxical communicative relationship, where control and fantasy play a big part. I was interested to create some sounds that through repetition or accumulation start to create their sense – some kind of universe, or how from non-cohesion some kind of fragmented narrations or conversations with those things can happen. How would I describe it? It is somehow a dependent universe instead of being an interdependent one. So, I think that the relationship I have, especially with some of the objects, is much about wanting to hold on, or the difficulty of letting go, but also about feeling things through touch, through breath, through voice. The piece begins with a formalist approach of sounding objects. Them making sound, me making sound for them and slowly it dribbles into something else. Do the letters of the title Hmm synthesize this process? Could you tell me more about the title, why did you choose these letters? I was thinking of Hmm as a contemplative onomatopoeia. It could be many things. That’s what I like about Hmm. It could be someone saying something and you thinking “Hmm..?”. Maybe it’s like this or maybe it’s not. Or it could be “Hmm..” like an expression of pleasure. The interesting thing about it is that the nuances appear with the pronunciation/the way of pronouncing the word? And indeed you pronounce the word during the performance? It appears now and then in the performance, but not in a very obvious way. I don’t start from “Hmm..” for instance but it is there. When I use text in Hmm, it’s very minimal in terms of words and sounds, unlike in my recent work RRRRR (2016) which is much based on spoken word and sound poetry. There´s not only “Hmm..”, there’s also other sounds like “ah” or “oh” that have their own set of associations. What I liked in “Hmm..” as a title for this work was that it allows a kind of openness. “Hmm..” could also embody this sense of astonishment like when you’re looking at things and you don’t exactly know what they are or what is going on when you contemplate on things. Could you tell me more about the scenography at the Schauspielhaus? Well, like I said before, at the beginning I had pens and for me sticks embodied more or less the same form but are bigger so it was a natural transition from OH NO. 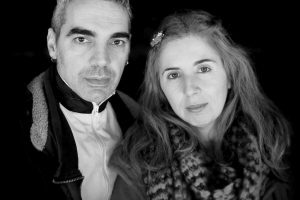 I worked together with a dramaturge and a visual designer Miguel Angel Melgares. It was a very collaborative process. Miguel came to the studio where I had some pieces of wooden sticks as well as some other materials. I had been exploring the sounds of these objects. We chose for wood because it is a basic material that one can buy cheaply, anybody could buy it, it’s not an inaccessible or a spectacular material, it’s at the core of any construction. So, we thought that wooden sticks would be a simple basis to start a landscape. On stage they are already cut and painted in gradated colors, dégradés by Miguel. Actually, I don’t like to talk about set design because for me they are co-performers more than just a visual aspect. I was speaking much of this in-betweenness of language, when language is not yet in the definition. Visually it manifested itself in dégradés because it is kind of a color that transforms to another but it is not a definite thing. So, we took this as a principle for the visuals, this in-betweenness, these transformations, color moving. The lights have a similar principle. They are quite choreographed, in the beginning very minimal, but they have their own kind of movement. We used three choreographic principles. They are using the same color codes than the sticks: pink and green tones. I would say that in this work for me all the inanimate things are as much alive as the human body because everything is choreographed and scored in a communicative manner. There is also composer Natalia Dominguez Rangel who is playing synthesizer live, off stage. Even if she’s not seen, in those moments when she plays with me, there is this aliveness, this playfulness, listening to each other. So in that sense the ecology of the performance is not a solo because there are all those elements that speak with one another: there is the sound that speaks, there is my vocal that speaks, there is the light that infiltrates etc. It’s actually a very communicative piece, even if it sometimes looks hermetic. One just needs to open their senses to these subtle formations and dialogues. In this hermetic, how do you conceive the relation to the audience? Is there any interaction with the public? This is a closed universe that I wanted to create in a sense that, there is no direct addressing of the audience. I don’t even use much of my eye contact to the public because I have been interested in this quality of performance that deals with intimacy, sculpture and relations in a different way. Some spectators have previously described my work as being hermetic feeling that they couldn’t relate to it. Instead of considering this climate as a being problematic, I think it is an interesting situation. We have long traditions of flirtatiousness, participation, guiding through, direct addressing of the audience in the theatre. In this piece you become a witness of your own internal meanings, readings, non-sense, desires and fantasies. This is how I like to think about it. Hmm is a conventional stage work by its frame, in the sense that its duration is between 55 to 60 minutes, people come, it has a beginning and an end. 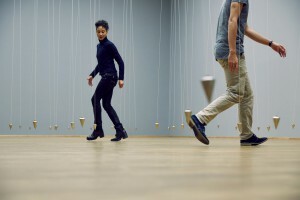 In that sense, it does not communicate with durational installation performance for instance, which could change some of the ways in which it is viewed. Placed in conventional theatrical setting I have concerns that people have much more of this expectation of firstly, the spectacle, secondly, addressing or guiding through, thirdly, understanding through assimilation. But I am divided in this, because the “wall” also provides something-perhaps anonymity to the viewer which can be good in this work. For instance, when I worked with autistic people, I never experienced them being non-communicative, even if they were totally in their own things, if they didn´t notice me, or seemingly didn’t care about me. Once, I asked one person whom I was working with if he could film me and another participant doing some duet material. When I saw the film, I realized that during all this time he had been filming the floor and the shadows of our feet on the floor. At beginning I was surprised, but then I thought that this was the most artistic documentation proposition I had seen in a while. And even though I could not fully place his desire or intention, I could understand his project through his rationality and choreographic understanding of the situation. I believe that Hmm even though deviating from some common practices can communicate to some existential parts in everyone of us. But if someone doesn’t relate to the work, it’s also fine. I don’t feel that I have to try to include everybody because I find this quest for community and similarity very dangerous and scary. Very often the communities we build today are closed ones. I find it much more interesting to speak about diversity and deviancy and how we can still coexist. And I think that one of the most important missions of art for me is to provide a diversity of propositions, because otherwise art would not exist. Right now there is this a lot of discourse about revealing the notion of “fakeness” on stage, and actually I think what my performance is doing is a little bit the opposite, it’s trying to constantly unveil some sense of sincerity. The work is much scripted. There is a score that I’m following, so I am busy working and on another hand it is much about trying not to perform. Even though my quest to « not to perform » is a total paradox, I believe this quest produces a certain kind of performative presence that is more complicated to place. To see fragility and intimacy on stage can be off-balancing because it is a seemingly unstable situation. It somehow hovers within the performative act and the humaness of it all. I don’t want to play with this sarcasm of traditional performance, yet there is much humor and playfulness in my work. You have a multidisciplinary approach of art. There is the performance art, the publishing part, etc. Can you comment on your background and approach of art? Originally I have a background in classical music. I used to play French horn and piano. And I see that my background in music is very present in the ways I think. I started dancing only later, when I was 16, and then I pursued BA degree at Laban Centre. After Laban, I went to Ireland for a one-year artist residency and I think it was a shifting point, where I started to integrate my love for drawing into my praxis. I have always drawn but I am totally self-taught. Now I see that as a working methodology as well as a form in the actual works, the praxis of drawing keeps coming in. OH NO for instance was the voyage of pens but also the traces that they left and I was very much contemplative about rhythm, notation and trace. I also made a small drawn publication with this work. With my recent solo work RRRRR I made a drawing book of 50 pages with some text also. I think this way of notating, or leaving a trace or making an imprint is something very reoccurring in the way I work. In RRRRR, I started from drawings, in that specific case of metamorphosed naked figures. Eventually, I did not find a way of integrating them into the actual performance since they seemed to already tell so much of a story and I wanted to leave some space to the sound and embodied work, some space for interpretation. But indeed I like to make publications although I don’t know much about the visual art scene. I see a lot of things (I’m very interested in art brut and self-taught artists) but I never exhibit in a fine art context myself. What I do is always related to my performances. What I try to communicate is some social question, some social values in relation to behaviorism, alternative psychology, the way we consider normality in our society today. Everybody speaks about it but our reality is totally based on success orientation and society of show, where self-image creation seems to be much more important than the genuinity of who one is. I feel that my works are dialoguing with those topics. In RRRRR, I was looking into schizophrenic structures. It was not an attempt to portray an ill person but more to look at the common: the hallucinatory and delusional aspect of the present world and how I would experience it. In my upcoming project, I’m planning to step out of performing myself and I’ll work with some others. In your pieces, there is a strong reflection on art structures, on the communication inside these structures, at their borders and outside.. I make micro statements through art, border practices, sometimes at the peripheries. In my own intimate way I try to say that other languages (as the languages of the autistic people I worked with) are as valid as ours, read them. My attempt is to create contexts for sharing different knowledge outside of social class or other “boxes”. I believe there is still a lot of segregation and it´s currently growing. Institutions such as art institutions embody a sense of authority and validity. For instance when I did the duet with Veera Kivelä from Without an alphabet project, we did it once in a, let’s say, validated dance and fine art context where I felt that it really took its place as an art piece and not as a community praxis. Then we did it in a community art festival and I felt the opposite happened. Veera and I trained a lot to make that duet appear and even though she is not a professional performer, it was mainly her language that was put on stage and hence a lot of expertise was shown. There is something about claiming the right space for each artistic proposition. In the case of the duet with Veera it was also important to perform it where it was accessible to the community around her. At the Eastern Regional Dance Centre in Finland, who is well known for its inclusive practices and audience, a lot of people from the center where she lives came to see her and still you had people from let’s say the more bourgeois artistic scene. These contacts are important so in this sense I feel it is important to work in established institutions and try to bridge different audiences and participators. Plus I think my work has this social aspect, but I’m not a community artist. I’m working with this idea how my artistic praxis can be collided with people who have other specialties. It’s about sharing expertise and doing research. I don’t want to be an art service provider to those communities since in most of these cases the emphasis is rather on the giver-receiver relationship than happening on an equal ground. My work is about discovering other patterns of language and another vocabulary of movement, the big spectrum of identities and the ambiguity of our existence. It is speaking about something that can’t be caught in a box. It is speaking about the queer in a larger sense to enlarge the borders of normality in a neoliberal world were the borders of it have become very tighten. This appearance of the so called isolated, hermetic, singular universe appears only so because of our normative set of patterns: the way in which we organize knowledge and understanding. It appears only separate because of its contextual relation and the parameters and set of expectations directed to it. If the world was slightly less normative, if the world was not obsessed with separation and boxing, universes like Hmm, or autistic languages like in TU, could be experienced indeed connected, as part of creating a complex net of meaning and understanding instead of something else, something different. And I think there are a lot of people who do. Perhaps it is something like a blurring of the wall between unconscious and conscious, between intelligences, opening window for complex, non-logical, non-linear, non-explainable, even mysterious universes of the mind and the environment it is speaking with that I am interested in exploring and proposing through my work. Interview conducted on July 28th as part of ImPulsTanz – Vienna International Dance Festival. Photo © Patrick de Rham.